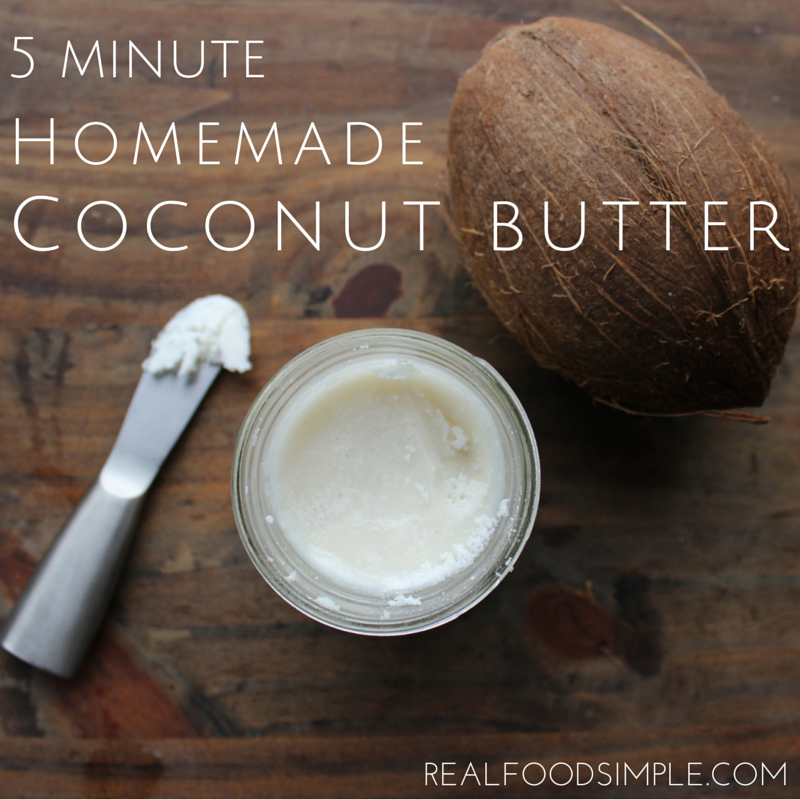 This is a simple way to make coconut butter that takes only 5 minutes and is much cheaper than pre-made coconut butter. Coconut butter is basically shredded coconut that has been creamed to create a butter with nut butter-like consistency, although it is a bit thicker and dryer. It is a great substitute for those with nut allergies. It is also great for those wanting to get more healthy fats into their diet. This definitely tastes like coconut. So you have to like that flavor. Coconut butter is not always easy to find. My regular grocery store that has a very large natural foods section does not usually carry it. So I either have to go to our local natural foods market or order it online. It is usually more expensive when bought pre-made. The other day I noticed bags of shredded organic coconut on sale (but actually this brand is much cheaper than I paid). I cleared out the shelf (only 3 bags) and decided to make coconut butter at home. Most recipes I have seen say it takes about 20 minutes. So I was prepared for this to take some time. Not that 20 minutes is a lot, but I thought I would have to babysit it so my nutribullet wouldn't overheat. I was pleasantly surprised when it only took 5 minutes. I think others have used food processors and for some reason it made the process slower. I used our nutribullet. This is another win for the nutribullet. I have made smoothies, chocolate peanut butter, and other nut butters. It is definitely versatile. And now I sound like a commercial. But I swear I was not paid in any way to say this. This is my experience. You don't have to use the nutribullet, it just might take longer. 1. Take ~1/2 cup of the coconut. 2. Put it in the nutribullet and pulse until creamy. 3. Take out the creamed coconut. If you do use a nutribullet, I have found that only putting in about 1/2- 3/4 cup of shredded coconut works best. The more you put in, the more you have to scrape the sides and it will take much longer. I only had to mix it about a minute to a minute-and-a-half. *I used an 8 oz bag and ended up with 6 ounces of coconut butter.